Specialising in Architectural photography since 1990, Martine travels across the country for her clients who include architects, construction companies, interior designers, advertising agencies and magazines. All aspects of architecture and all types of buildings and settings are covered including offices, hotels, schools, shopping centres, historical buildings, sporting facilities and residential projects. Her work has been widely published - and broadcasted - over the last two decades including for the BBC4 series A Digital Picture of Britain. In 2009, she was a national RIBA judge for two regions, was awarded an honorary doctorate by The University of Nottingham in recognition of her work. In 2012 and in 2013, she was asked to be a global ambassador for Manfrotto - the camera tripod and supports specialist. 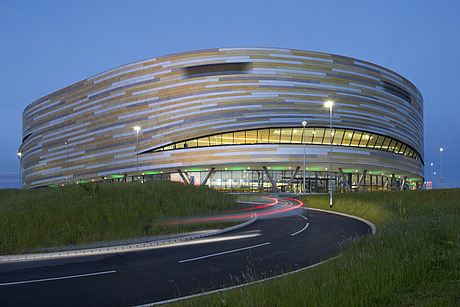 For her profile picture, Martine chose her shot of Derby Arena by Faulkner Browns: "I love the shape and the cladding - and being a velodrome where bikes sweep gracefully round the track, I like the fact that the car taillights are also sweeping round the curve towards the building in this shot. This hints at the movement which continues within and after all, is what this building is all about."